SLU is a very research intensive university, with special responsibility and assignments to serve the bio-based trade and industry with knowledge and competence, as well as having the responsibility for environmental monitoring and assessment in Sweden. Research activities at SLU cover a very broad range from life-science to economics, and both basic and applied research thrive in our dynamic environment. 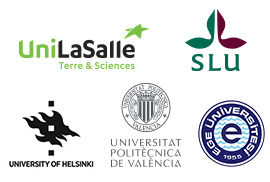 The educational programmes offered by SLU are unique and based on our strength and profile areas, a bio-based economy and environment, health and life quality. The combination of teaching and research provide students with countless opportunities for interesting, in-depth studies and specializations. SLU offers a wide range of bachelor- and professional programmes taught in Swedish, as well as sixteen world-class international masters’ programmes tightly linked to our strong research areas. Most teachers are active researchers, and being a research focused university means that we have one teacher for every fourth students. Plant sciences constitute a strong and important area for research and education at SLU. The activities are divided between the three main SLU campuses located in Umeå, Ultuna (Uppsala) and Alnarp (close to Malmö), and they are mainly linked to forestry in Umeå, agriculture in Ultuna and horticulture and agriculture in Alnarp. The plant science topics cover both basic and applied science from molecular studies on plant development, plant-microbe interactions and epigenetics to plant production and protection. A significant proportion of the efforts are dedicated to the support of a sustainable agriculture in developing countries. Plant breeding-related research at SLU covers many areas, like cultivar development, development of genetic resources, domestication, technology development and studies of specific mechanisms. These activities take place at the three main campuses and cover forest trees, horticultural and agricultural crops. The Master program in Plant Biology covers many aspects of plant life and crop production, such as plant diseases and how they affect both the yield and quality of products. Knowledge of plant functions and their interaction with their surroundings is necessary for sustainable plant production and hence sustainable development. The aim of the programme is to prepare for post graduate studies and research in plant biology as well as to give an education attractive on the job market.